If you want to re-use track that has ballast glued in place you’ll probably be wondering how to recover the track and remove the ballast. Here’s how I solved the problem recently. If you’ve been following the progress of my layout, you’ll know the track plan has undergone a few changes. One of these necessitated changing a section of track to which I’d already glued the ballast – D’oh! Pulling the track up revealed some royally messed up track, with ballast stuck to sleepers and rails and worse on the underside of the sleepers making it difficult relay the track flat. For real, full size, railways getting rid of ballast is a hugely expensive and time-consuming. Network Rail, the UK’s national rail infrastructure operator, has spent £50million buying a huge complex but very frankly awesome machine to clean the ballast on full-size tracks. A video of a track laying and ballasting machine is below and is absolutely worth watching if you like big machines. 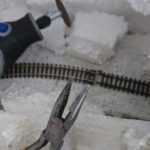 Thankfully, it’s a lot, lot, lot cheaper and easier for model railway enthusiasts and after several attempts at discovering how not to remove ballast 🙂 I worked out the following 5 step technique to remove ballast from “accidentally” laid tracks. These steps work on Hornby, Peco or other manufacturers’ N, O or HO gauge tracks and to clean up old or second hand track that has ballast and other debris from previous layouts stuck to it. Assuming the track is in place on the baseboard, gently apply a coating of water – remember to disconnect the electrics first! Let this soak in for at least an hour but no more than 2 hours. You want the ballast damp but not so wet water soaks into surrounding areas and ruins the trackside landscape. Initially, I used a water sprayer but couldn’t get keep the spray area confined to just the track. I then used the techniques I used to apply the ballast glue in the first place, using a syringe but this time filled with water and appling it to the central track bed and sides. This gave the best results, allowing me to precisely control where the water went but do be careful with amounts or there’s a risk of soaking the baseboard too much. Next, run a stiff Nylon brush or old tooth brush over the track to free up surface ballast and loosen the rest. 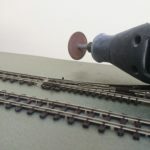 Don’t use the wire bristle type brushes as these will scratch the rails and sleepers. Then run over the area with a small vacuum cleaner to clear the track. With my eye on saving money, I brush the the loosened particles away from the track area and re-use them for rock falls at the base of cliff faces. The ballast has been dampened and the track is being gently lifted free before further work. Assuming your track is glued down, gently prise it up. If tacked down, carefully pull the tacks with pliers and lift the track section in question free. A flat head screw driver or wall paper scraper (if you have space at the sides of the track) can be useful to get under the sleepers and pry it free. This is the part you need to be most careful about, use too much force you could end up with bent rails or snapped sleepers. Another technique I’ve learnt is to cut the rail joiners between track sections rather than trying to lift and separate the track with the joiners intact. Although the track can be lifted and joiners removed, I’d rather buy a few new joiners than put strain on the more expensive rails and bend them out of shape. With the track now free of the board and most of the ballast left behind, courtesy of step 2, soak the track in warm soapy water for a few hours. With the Nylon brush scrub the track and sleepers to clean off the remaining ballast. You may also need to scrape parts of the track and sleepers. Initially I used the scalpel to do this but only ended up leaving horrid marks on the sleepers. On the second attempt I used a small watch-makers or jewlers flat-head screw driver. This gave much better results without the damage inflicted by a knife. Spot the difference, from top to bottom: New track, track de-ballasted, track before the cleaning. There’s little difference between new and cleaned track. One last tip, don’t forget the underside of the track. 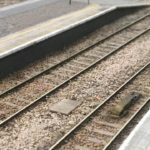 The top side is naturally where you want it looking best but anything stuck to the underside of the sleepers will prevent the track lying flat when it is laid again and cause problems getting the rails to line up. And that’s it. The track is now back to near original condition and without a £50million super machine! As can be seen in the picture right, there’s little difference between new track (top) and track de-ballasted using these steps (middle). In a short time, your old track will be ready to be used on your next layout or new track plan. Before you do so however I’d give the rail heads a good clean in case any dirt got onto them during the ballast removal. See how to clean model railway track for tips on this. If you liked this tip, I recommend one of these excellent model railway books which are packed with tips and advice like this for building and running your layout. This article is a real life saver. Recently had a turnout go bad just after ballasting the section. I followed the directions above, using hot water and the ballast came right up. I no longer see ballasting as the ultimate sign of commitment on the layout. Thanks Jim, glad it helped and was useful. Points breaking are the bit I dread on layouts but at least removing the ballast isn’t a problem now. PS, what gauge do you work in? I’m gonna have to try this because I noticed a little dip on one end of my new layout extension. The problem is in an area about 10 inches in length but is causing the cars to uncouple.